AT90USB162 is the easiest way to add USB functionality to your next device, Atmel provide free open source HID (mouse, keyboard) and CDC (USB-to-RS232) code and on top of this AT90USB162 cost is same as ATMega16, so what you are waitng for? 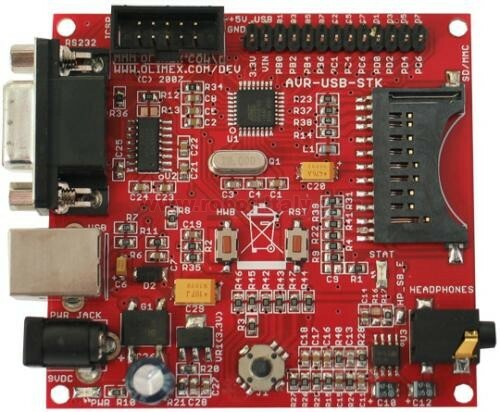 AVR-USB-STK board allow all USB features of AT90USB162 to be explored. €39.35 Special Price! Save until stocks last. AT90USB162 is the easiest way to add USB functionality to your next device, Atmel provide free open source HID (mouse, keyboard) and CDC (USB-to-RS232) code and on top of this AT90USB162 cost is same as ATMega16, so what you are waitng for? AVR-USB-STK board allow all USB features of AT90USB162 to be explored. 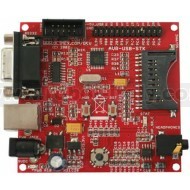 The board have USB connector, Joystick, RS232, SD-MMC card, Audio output, ICSP connector and extension connector. All AT90USB162 come from Atmel pre-programmed with bootloader which allow code to be programmed inside the chip without any external programmer, just download the FLIP software from Atmel web site and load your HEX code inside AT90USB162. To enter the bootloader mode you shoud press and hold HWB button, then press and release RST button. If you preffer to use ICSP programmer note that only AVR-ISP-MK2 is supporting AT90USB162 as there are pretty new devices, probably AVR Dude will add support later, but for the moment you can't use AVR-PG1 or AVR-PG2 for ICSP programming, another bad news is that AT90USB162 supports only debug Wire not JTAG so to debug it you should have the expensive AT-JTAGICE-MK2.